What better way to celebrate the 30th anniversary of an iconic model than to introduce a brand-new design to succeed it? 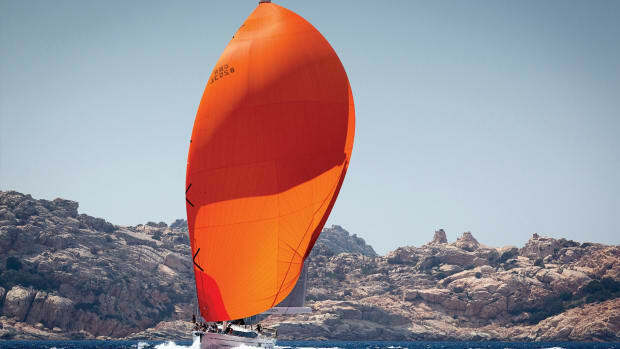 The original Dehler 34 achieved near cult status with 1,300 hulls launched, so replacing it with a fresh design suited to the tastes and needs of today’s racer-cruisers was no small task. 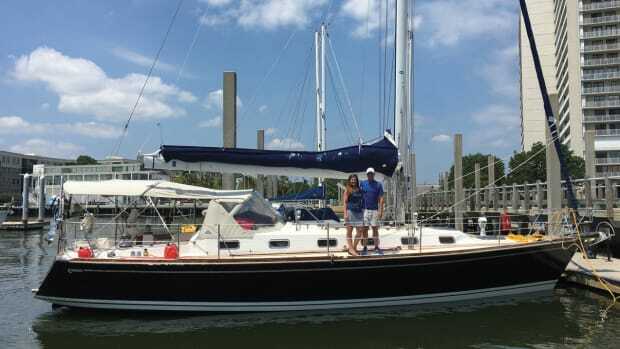 Luckily, it was done with aplomb as evidenced by the all-new 34-footer that is poised to succeed it. Part of the Hanse Group, Dehlers are designed by Judel/Vrolijk, a firm renowned for its performance hulls and sleek decks. Construction includes a vacuum-infused core sandwich with an integrated carbon-reinforced “cage,” as Dehler calls it, which provides stiffness while adding minimal weight to the overall hull structure. The fractional rig supports a tapered, keel-stepped Seldén mast with double aft-swept spreaders and a total sail area of 672ft2 that splits between the 105 percent jib and a traditional mainsail. An adjustable backstay with a purchase system is at the starboard helm. An L-shaped shoal keel drawing 5ft 1in and deep-draft fin drawing 6ft 4in are available, as is rod rigging. A competition version, which weighs 1,102lb less and carries 92ft2 more sail area, is offered with a carbon mast that is a foot taller. An integrated composite bowsprit is part of the performance package as is tiller steering, a deeper rudder and a T-shaped keel drawing 6ft 9in. 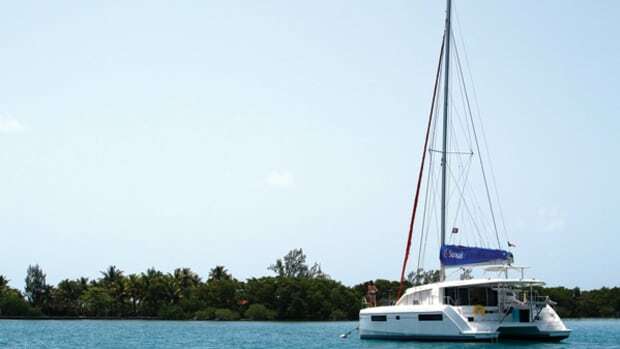 For easy boarding as well as fun water access, the Dehler 34 has a manual drop-down transom. 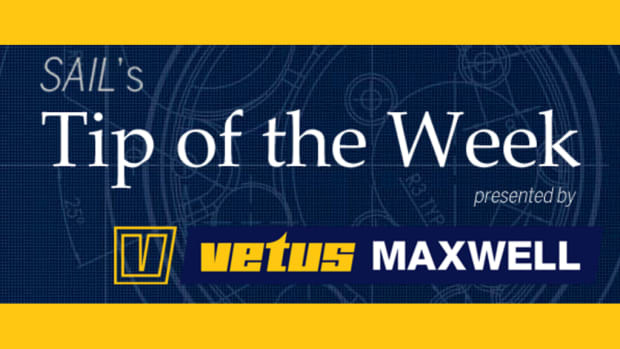 Those in search of extra performance may opt to save weight and go without it, adding only two wire lifelines for safety. The cockpit will work for either racing or comfortable cruising. The table is removable, and the inboard settee edges have a groove that will channel water away from cushions and provide a nice foot brace for crew seated on the coaming. Our test boat was outfitted with Lewmar’s R+ racing winches and a German-style continuous mainsheet system, which is adjustable from either side. The traveler spans the cockpit sole just ahead of the twin angled Jeffa Steering pedestals. A bit of high-tech-looking luxury are the optional Carbonautica composite wheels and the integrated instrument consoles that house B&G instruments and a 7in Vulcan or Zeus multifunction display at each helm. Depending on the outfitting package, real or synthetic teak can cover the cockpit seats, the cockpit sole and even the main weather decks. Without the teak, the decks are covered in a nonskid that is rough enough for sure footing but not so aggressive as to tear up knees and clothing. A molded uncapped toerail adds a bit of safety when heeling without adding any exterior wood. 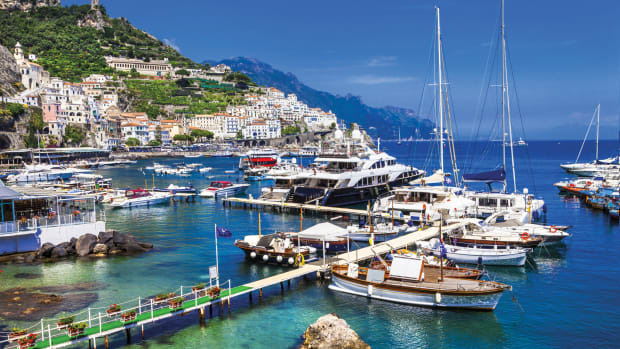 Jib tracks are well inboard, which keeps sheeting angles tight, and the halyards and reefing lines are led aft in under-deck conduits to a set of Spinlock rope clutches on the cabintop. All the hatches are flush, so there are no toe-stubbers. The cabin portlights open out for ventilation even when it’s raining and are set into elongated Lexan covers that create an attractive “eyebrow” on the outside. Sheet-friendly pop-up cleats are standard. The layout includes two cabins and one head with a bit of customization available. For racers, the V-berth can be left open, so that sails may be dropped through the foredeck hatch and then gotten to easily from the saloon. For those who will spend more time cruising with guests or family, there’s an optional forward bulkhead that encloses the master stateroom for a bit of privacy. The saloon has a drop-leaf table on the centerline so four can dine in comfort, and the aft end of the port side settee serves as the seat for the aft-facing navigation station. The L-shaped galley is to starboard and has top and side-loading Isotherm refrigeration, twin sinks and a gimbaled two-burner Eno stove/oven combination. Dehler’s signature dual-function door encloses the entire head or opens up, so the sink is accessible while the toilet/shower remains private—simple, yet functional and very smart. 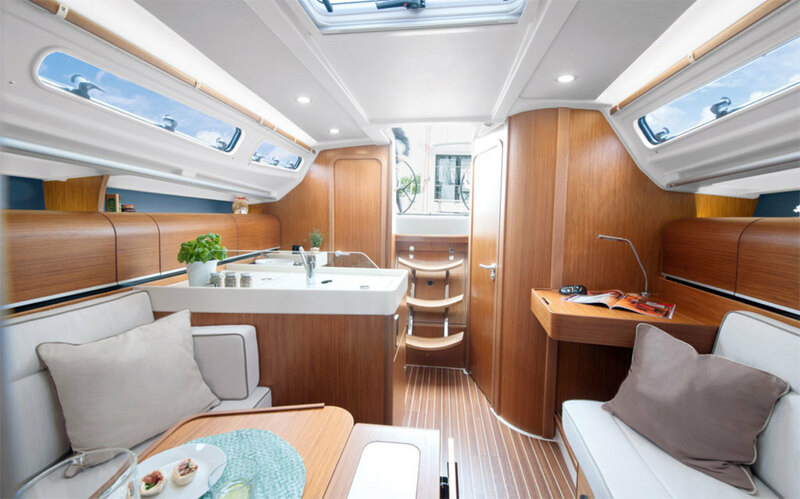 Like its larger sisters, the Dehler 34’s interior is loaded with rounded lockers that stretch along both sides of the hull. These provide quite a bit of stowage and make for a clean and very attractive design aesthetic. The standard finish is mahogany, but teak and American cherry are offered as well. An off-white cabin sole called Australian acacia is standard, but you can also opt for a dark finish, or classic teak and holly striping. Despite its performance potential, there’s nothing utilitarian about this boat, and the Dehler 34 will not only cruise in elegant comfort, but also likely be the envy of anyone in the anchorage who stops by for a sundowner. 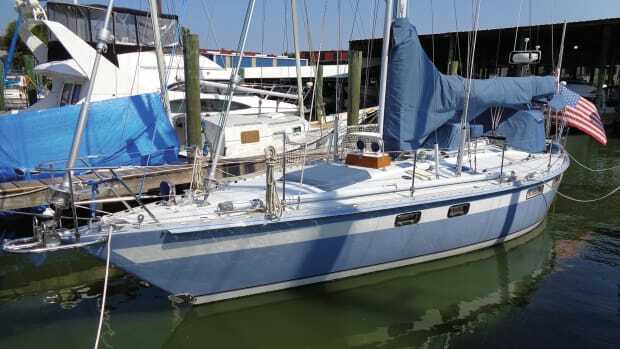 Our test day on Chesapeake Bay started out with a disappointing and fluky breeze that did not show the Dehler 34 to its best advantage. But as time went on we got lucky as 6 knots materialized briefly, gusting to 8. With a displacement of just over 13,000lb and minimal equipment aboard, the boat managed to come up to 4.6 knots at a 40 degree apparent wind angle. What’s more impressive is that she pointed up to 35 degrees without stalling. We did not have a properly sized downwind sail, but no matter; the breeze was done teasing us and shut down completely. Too bad, because having sailed her 46-foot sister, I know how much fun Dehlers can be in a blow. 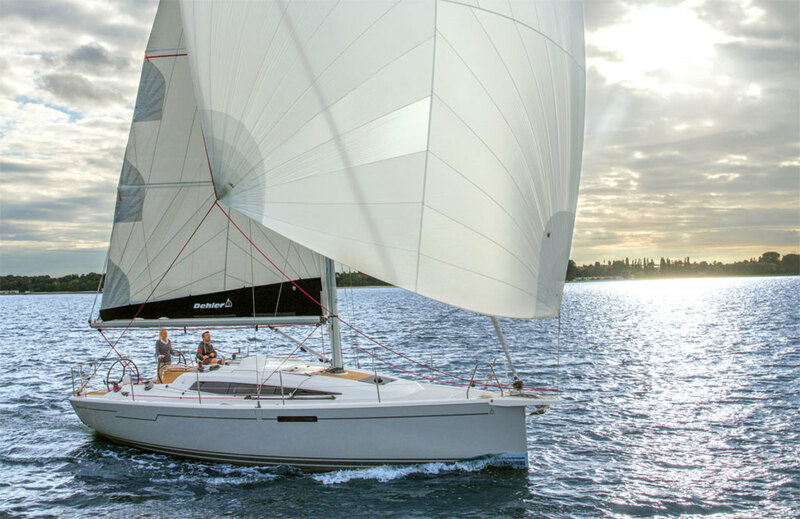 Dehler offers several “pricing packages” for racing and cruising, and within those there are still more options, especially for sails, all of which are by Elvstrom and range from standard triradial-cut FCL Dacron sails to the company’s high-performance HPM canvas. (Our test boat had Dacron sails, an aluminum mast, a full transom and twin wheels.) The mast track cars on our test boat were nice and slippery, making raising and lowering the mainsail a pleasure. Auxiliary power is provided by an 18hp Volvo Penta diesel (upgradeable to 27hp power plant) with a saildrive transmission. On flat water with little breeze and just two of us aboard, we motored at 6 knots with the throttle at 2,200 rpm on the upgraded engine turning a two-bladed folding propeller. At wide-open throttle and 2,800 rpm, we accelerated to 6.9 knots. Tankage is adequate for weekending with 61gal of water and 42gal of fuel. Had I been dropped onto the Dehler 34 and told that it was a bigger boat, I’d have believed it.  This 34ft dual-purpose vessel feels like a 38-footer both under sail and under deck. 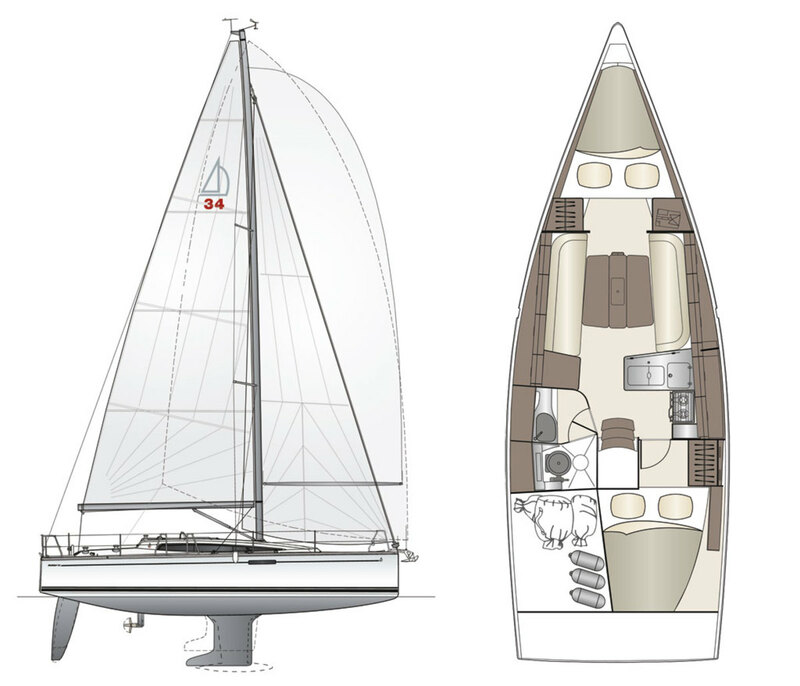 Dehler is positioning the new 34 as a “legend reborn,” and for once I agree with the hype. 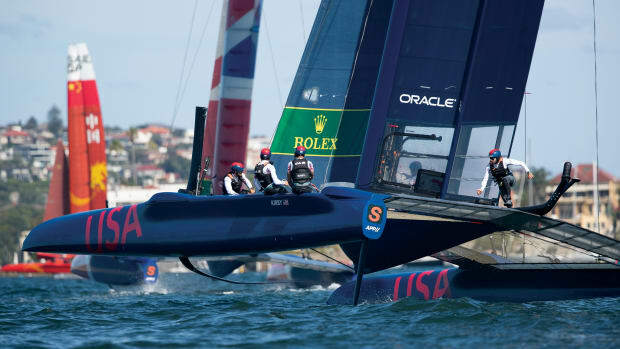 It’s an agile boat that can be raced or cruised without compromising either sailing style. This new design may well live up to, and even ably succeed, its classic namesake.